Community banks are struggling to build a training curriculum to develop branch bankers of the future. Aside from moving from a transaction to an advice, sales, and service culture, they also struggle with operational training. The story of declining branch traffic, and the resulting reduction of branch transactions, is reducing the repetition of common and uncommon transactions alike, and therefore the opportunity to improve operational skills of branch employees. When I was a branch banker over 20 years ago, I went to headquarters, stood at mock-up teller lines with a dozen of my colleagues, and a trainer drilled us on running common transactions with enough repetition to imprint the "how to" in our brains. Well, at least my colleagues brains. I never claimed to be an operational wizard. Some banks still do this. But with branch turnover down due to a weak job market, and the industry moving to universal banker, these training test beds are on the decline, in my experience. As they should be. No reason to institutionalize what is quickly becoming an outdated model... tellers standing behind the rigid teller line anxiously awaiting for the flood of customers that no longer come. So how do banks increase proficiency with transaction processing? Most accomplish through on-the-job training (OJT), in my experience. But with common transactions being done less frequently, particularly in smaller or more rural branches, and uncommon ones perhaps happening once per month or less, how are branch bankers getting the reps needed to become proficient? 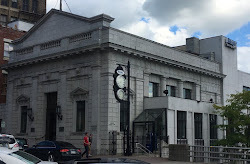 Some are being deployed to a bank's busiest branch, typically the headquarters office, for some OJT before being deployed into the branch network. This is a natural reaction to get reps, and be productive once sent to their primary branch. But how can your core processor be helpful? Those that have been through the painful core processor conversion experience know that the Fiserv's and Jack Henry's of the world establish a "test bank" to get your people proficient at all sorts of interactions with your soon to be deployed core. My question: Why give this up? 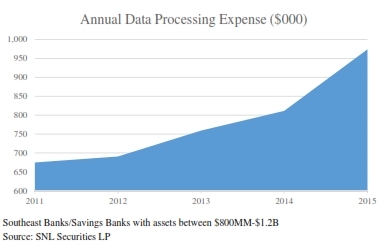 I reviewed all data processing expenses for Southeast banks with assets between $800 million and $1.2 billion in total assets. Community banks. The results of my analysis are in the chart below. In terms of the Call Report, Data Processing Expense category, these banks spent on average almost $1 million in 2015. And the trend is decidedly up. Not a small sum. In my firm's profit improvement engagements, we see wild fluctuations in core processing expenses. Telling me: 1) banks buy different services from their core processor, and 2) there should be negotiating flexibility given the dollars involved. What I suggest is negotiating a "test bank" that remains open for continuous training with your employees. Not just branch employees, but everyone that interacts with the core. This will improve the effectiveness of your OJT program, increase transactional proficiency, and allow your bank to dedicate more resources to higher level employee development. It will also retire "Mickey Mouse" and "Donald Duck" as customers. Bankers know what I'm talking about. There's enough margin in that Fiserv contract to make this happen. Make it so!